Haven't done one of these posts for a few weeks! From now on I'm going to write one post at the end of each month instead of when I've finished a few products. I'm doing this as I've finished off the majority of products that are half used or sample sizes so it might take me a while to write a post. I really enjoy writing and reading these types of posts as it shows what I've been using and the products I actually like. 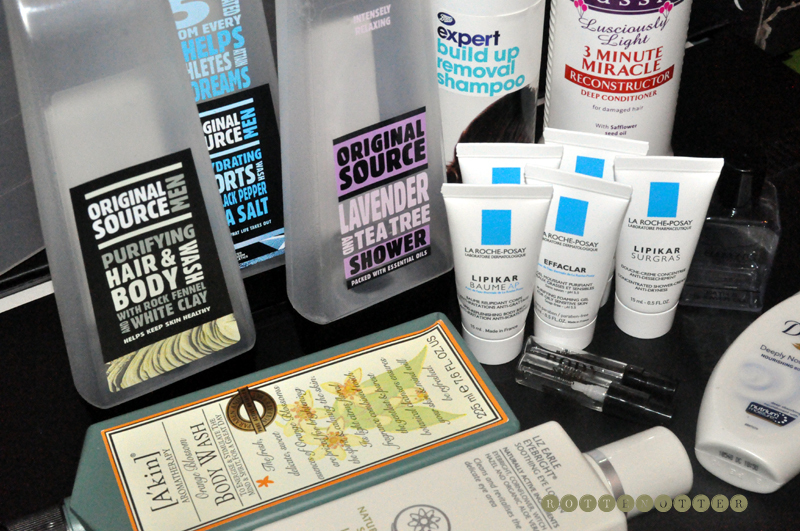 Original Source shower gels - Original Source is one of my favourite shower gel brands. They're cheap, smell amazing and they work as bubble bath as well as simply shower gels. I'd definitely buy the lavender and white clay ones again but probably skip the black pepper and salt one. Boots Expert Build Up Removal Shampoo - I always have one of these in my bathroom in case my hair ever gets that horrible product build up feeling. I probably only use it like once every 3 months so even though it's cheap to begin with, the bottle lasts a really long time. Luckily I don't need to buy a new one at the moment as I had a back up! Aussie 3 Minute Miracle - This is another hair product that I always have, in fact I probably have like 3 bottles of it. It's my favourite deep conditioner, along with a Andrew Barton one, and works wonders on my hair. La Roche Posay samples - I've really been enjoying using these samples I got in the "try before you buy" set I bought the other month. I'd never tried the brand before but have added a few products onto my wish list. These being Lipikar Surgras, a shower gel, and Effaclar, a cleanser. I already have the full size of Lipikar Baume AP and a full review will be up shortly. Elements shower gel - A simple hotel shower gel, nothing special but it smelt really nice. Burberry Body perfume - As soon as I smelt this perfume I knew I had to buy the full size and used up this tiny sample so quickly. I have the tiniest amount left but for some reason it wont spray anymore! Think this is going on my Birthday wish list. Memo Paris Moon Safari perfume - This was in last months Boudoir Prive box and I'm glad I got this particular one. It smells amazing but is slightly out of my price range at the moment, being around the £70 mark. Dove Deeply Nourishing shower gel - Think this came with one of my ASOS orders so it's only a sample version. It's a really nice shower gel but didn't have much of a scent so wont be buying the full size. [A'kin] Orange Blossom shower gel - Loved the formula of this shower gel but hated the scent. You can see my full review here. I'd buy it again but in a different scent like sandalwood. Liz Earle Eye Bright - I've lost count of what number bottle this is, I always buy a new one as soon as I run out. Can't be without! You can read my full review here.